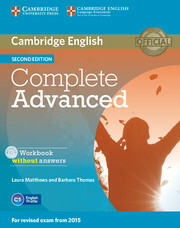 This Workbook without answers consolidates and extends the language and exam skills covered in the Complete Advanced Student's Book Second edition. The Audio CD provides all the audio material for the Workbook listening activities. The Workbook audio is also available online as Mp3 files. A Workbook with answers is also available, separately.